"Malls are often too slow to realise that malls are losing the traditional relevance as ‘aggregators’ of retail/F&B/service providers", says 4FINGERS CEO Steen Puggaard. Aggregation now happens in an app on people’s phones (eg., Asos/Lazada/UberEats/Amazon Prime), and consumer reallocation of spending is already causing havoc in the traditional retail/F&B sector. "In Singapore e-commerce is less than 5% and is only 1/3rd of US/UK but it has already affected the sustainability of old business models and e-commerce is growing steadily so operators need to be be prepared to take a hard look at the sustainability of their business model amidst new costs and new spending habits," said Puggaard. 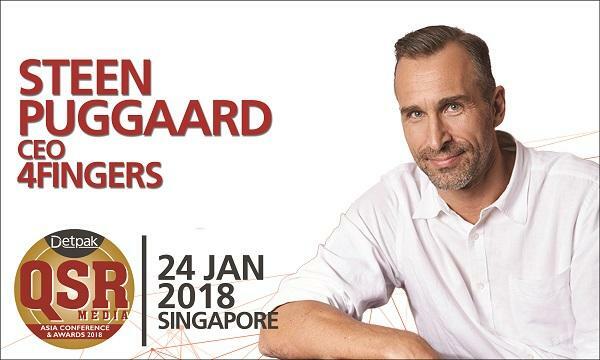 You can hear Steen speak at the QSR Media Asia Detpak Conference and Awards to be held in Singapore on January 24, 2018. "Consumers are more empowered than ever and have more and more choices at their fingertips so established brands are a risk of losing relevance," says Puggaard, who adds that another trend is the continuing growth in consumer demand for reasonably healthy food and responsible sourcing of raw materials. "An operators’ reluctance and/or unawareness of the need to change to maintain relevance (customer proposition as well as business model) amidst radical changes in the way consumers spend money is another issue," he adds. Puggaard believes in always putting the customer first and has a fascination with the F&B industry and the unique abundance of opportunities it represents, more than any other industry, to serve customers every day. Importantly, he sees a need to continuously disrupt and challenge the status quo in order to ensure that brands to stay relevant to consumers. He has played a key role in the launch of McDonald’s in several countries and recently introduced Costa Coffee in Singapore. A resident of Singapore since 1999, Steen brings with him over 20 years of experience an prior to joining 4FINGERS, his overseas roles included well-known corporations and mass-market brands like McDonald’s, Burger King as well as one of Singapore’s leading restaurant groups, Les Amis. Puggaard has held the position of CEO of 4FINGERS since February 2013 and has grown the business from one to 11 stores in Singapore as well as overseeing the launch of 4FINGERS in Malaysia and Australia. He also won the management excellence award in the food & beverage category in the Singapore Business Review's Management Excellence Awards 2017.